Marcel Kittel crushed his rivals into the same dust they were left to chase as he opened up his sprint and crossed the line well ahead of any other riders. Stage 3’s 190km run from Nijmegen to Arnhem is essentially one giant u-turn on the previous day’s affairs, likely to feature a greater amount of crosswinds however; no doubt adding to early tour stresses. Unless the wind really stirs and causes a level of trouble on par with that of Stage 2 at last year’s Tour de France, then Arnhem should enjoy another high speed Giro finale. Marcel Kittel already appears in unstoppable form after only a single win, seeing his Etixx-Quick Step team perform perfectly and deliver him to the ideal position to take the victory relatively stress free. A repeat is very much expected on Stage 3, which looks likely, but his greatest rival may in fact actually be the wind. Scything gales have the potential to cause mayhem during the day, though these are well anticipated by many, so their damage should be greatly reduced as long as riders maintain concentration. In regards to the chances of other teams scuttling the hopes of Kittel and co, FDJ were a surprise package and subsequently warrant keeping an eye upon. Arnaud Démare has long been known for his great turn of speed, though having lacked convincing support for so long now, Démare’s palmarés lack the quantity of wins to showcase this; a Milan-San Remo win certainly demonstrates the quality however. The surprising effectiveness of his FDJ teammates today saw him finish second behind an indomitable Kittel, but with better anticipation and preventing Etixx-Quick Step from delivering their German ace onto his back wheel once again, Démare could secure an early French victory. Sacha Modolo surfed the wheels with great success after his limited team resources dropped him off into a good position ahead of his sprint as the Italian rider secured third. On the right sort of finish it is easy to see Modolo taking a stage win at this year’s Giro d’Italia, though today does not tick the boxes required for that to happen. Giacomo Nizzolo was a real disappointment on Stage 2 after many, including us, had expected him to at least be in the mix for a podium place. The Italian could well have cooked himself earlier in the day at the intermediate sprints unnecessarily, leaving him short on the energy required to really have chance of winning. It would come as no surprise to see him keep his powder dry on Stage 3 instead, which would improve his chances no end, especially given his recent victories in Croatia. Moreno Hofland managed to turn in an almost solo effort amongst the maelstrom to take fourth place after making up ground rapidly before the line. The Dutch rider often goes under the radar at tours such as this and can never truly be ruled out of taking a win; especially if the winds take hold and riders such as Kittel miss the crucial echelons as they form. Caleb Ewan is sure to find this race a great learning experience for himself, one of the few who does possess the speed to better Kittel, though today he simply failed when it came to positioning himself well enough to contest the win. 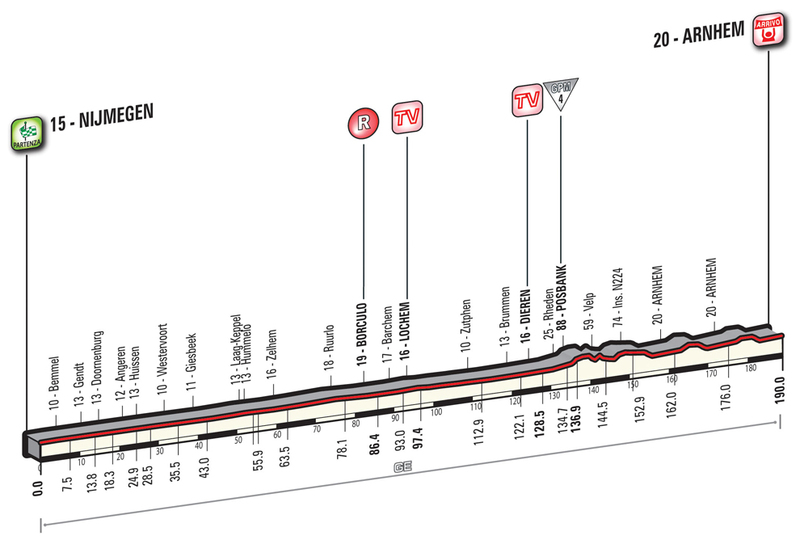 Posted on May 8, 2016 by Spokenforks	This entry was posted in Giro d'Italia 2016, News and tagged Andre Greipel, Caleb Ewan, Elia Viviani, Etixx-Quick Step, Giacomo Nizzolo, Giro d'Italia Preview 2016, Jakub Marezcko, Lampre-Merida, Lotto-Soudal, Marcel Kittel, Orica-Greenedge, Sacha Modolo, Stage 2, Team Sky, Trek Factory Racing. Bookmark the permalink.